The dogs we rescue come from high-kill shelters that struggle with the basic necessities. For 2011, we are launching our Adopt a Shelter program. Throughout the year our goal is to fill the wish lists of a handful of shelters so that we can broaden the impact of Copper's Dream. Food, toys, water bowls, cleaning supplies-- these are just some of the items these shelters need to improve the well being of dogs in their care. You can help by looking over these wish lists and contributing. Passing on the wish list items amongst your family, friends, and co-workers can result in an even greater impact. Perhaps your workplace or neighborhood can do a donation drive. 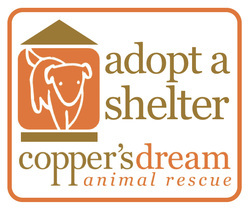 If you have questions about the Adopt-a-Shelter program, contact meghan@coppersdream.org. Selma, CA is located 16 miles southeast of Fresno with a population of about 20,000. Due to financial constraints, the shelter does not have regular business hours. They rely almost entirely on donations. Wasco, CA is located 24 miles northeast of Bakersfield with a population of about 20,000. The shelter is located at the end of a dirt road and is only open to the public by appointment. They rely almost entirely on donations. Used items can be donated, as long as they are clean and in good condition. Contact meghan@coppersdream.org for questions or mailing address requests. According to shelter volunteers, wish priorities are: dog food, crates, cleaning supplies, big water bowls, poop scoopers. You can donate a Kuranda elevated dog bed to Selma here. According to shelter volunteers, wish priorities are: a play area, new kennels, water bowls, dog food, and Lixit waterers. You can donate a Kuranda elevated dog bed to Wasco here.